When I was about 10, I challenged my dad to a footrace around the block. I’m not sure why I wanted to race, but my dad and I were always thinking up competitions with each other. I must have figured it was a no-lose race. My dad said his longer legs would beat me, but I knew that I was fast. Even faster with my P.F. Flyers. I knew I could out-sprint an oldie like him. We set the ground rules. From the tree in our front yard, we would run counterclockwise around the block. First one back to tag the tree wins. 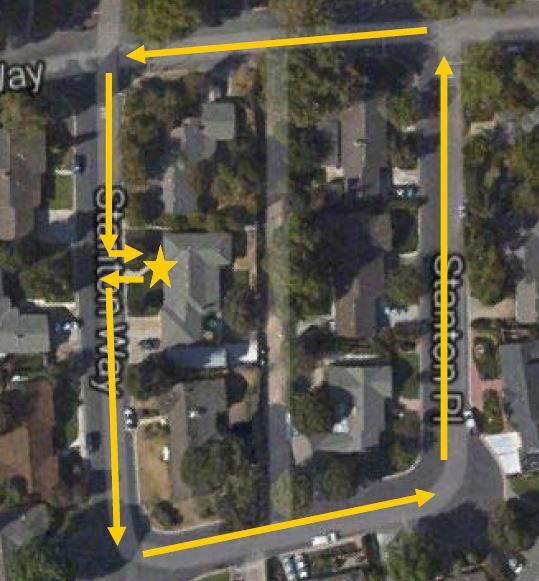 Google Maps confirmed that my childhood home — and the round-the-block track — in California still exists. But, the finish line tree-of-legend is gone. With the rules set, we took off into the street. A neighborhood block is much longer around than you think it is, especially when you’re 10 and your legs are much shorter than your dad’s. But, I picked up steam just as he was losing his, and I drew even with him somewhere around the houses that lined the block behind us. When we came to the final turn for home, my dad was pooped. I was hitting my stride. It was at that moment that my dad veered off the street. He cut through our next-door neighbor’s yard, hopped over the waist-high fence that separated our houses, and tagged the tree. 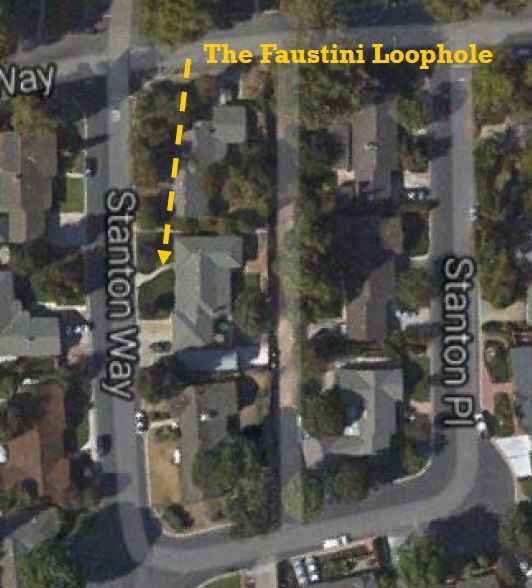 He had cut several seconds – and several feet – off of the race by short-cutting across Mr. and Mrs. Faustini’s lawn. I was still running in the street. Soundly beaten. I had yet to learn any of the wonderful, bleepful words that grown-ups use but children don’t. So, I probably just called him a “big cheater.” I was pretty mad. It would be my first time getting screwed by a loophole. There would be no rematch. I’m not sure my dad saw any great lesson in our race. He was just the kind of guy who liked to prank his kid from time to time. But, his non-lesson left a big impression on me, and I’ve been pretty careful about making ground rules clear ever since. Ground rules are a baseball thing. They are the special rules governing play that are unique to a park, usually identifying a park’s lines, corners, poles, and edges as fair or foul. At Wrigley Field in Chicago, if a ball gets stuck in the ivy it’s a double, but if the ball pops back out, it’s in play. At Tampa’s Tropicana Field, the four catwalks are governed by different ground rules. Hit the lower ones, it’s a double; hit the higher ones, a homer. Indoor parks have all sorts of ground rules for balls that hit the roof, trusses, cables, or other stuff hanging down. The Americans went on to hit 18 triples over the course of the eight-game series, a World Series record that still stands. The key thing is this – ground rules are unique to a single park or event. Here’s what’s not unique in baseball. There you have it. A ball that bounces from fair territory into the stands is a double. Nothing unique. Happens all the time. The rule is the same no matter where you are. It is not a ground rule double. It’s just a double. What do doubles have to do with my dad? Nothing really. But, my dad was a stickler for getting things like this right. San Francisco Giants broadcaster Jon Miller is a stickler, too. While most everyone else calls a fair ball bouncing out of play a “ground rule double,” Miller will call it what it actually is – an “automatic” double or a “rule book” double. Jon gets it right, but if you listen through, you’ll hear Mike Krukow get it wrong. And, look! That’s former Oriole’s closer Jim Johnson on the mound giving up the automatic! Though he liked the Dodgers, my dad wasn’t much of a baseball fan, but I think he would appreciate my using this Father’s Day post as an opportunity to set the record straight about ground rule doubles. 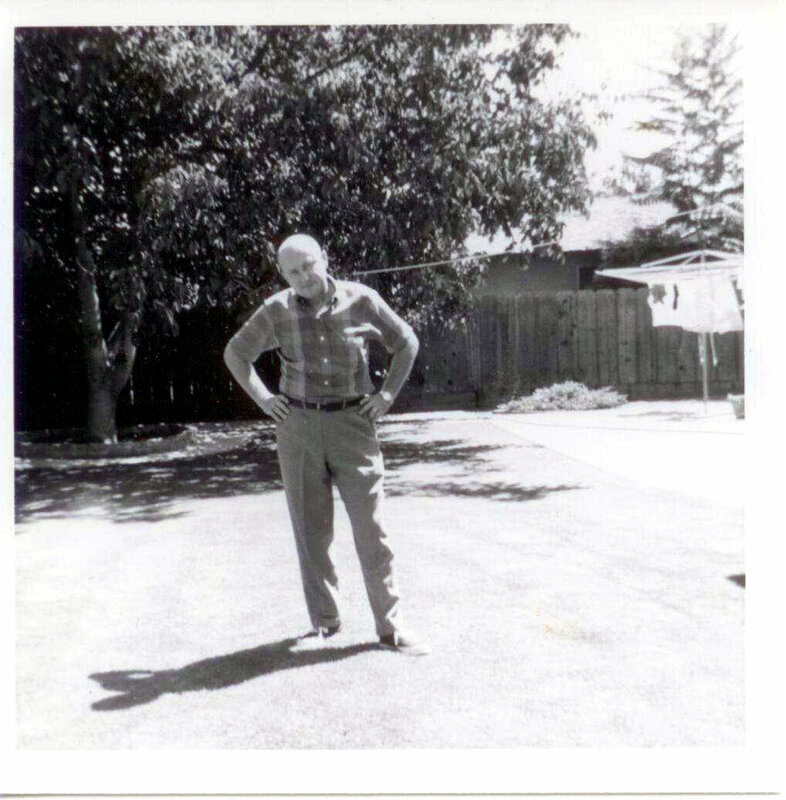 This entry was posted in Baseball, Life, Mom & Dad and tagged Fathers Day, Ground Rules, Jon Miller, Vin Scully by Jackie, The Baseball Bloggess. Bookmark the permalink. Your father had the home field advantage, it seems. What is in the plastic bag that you are holding? That photo of me was taken right before a dance recital. 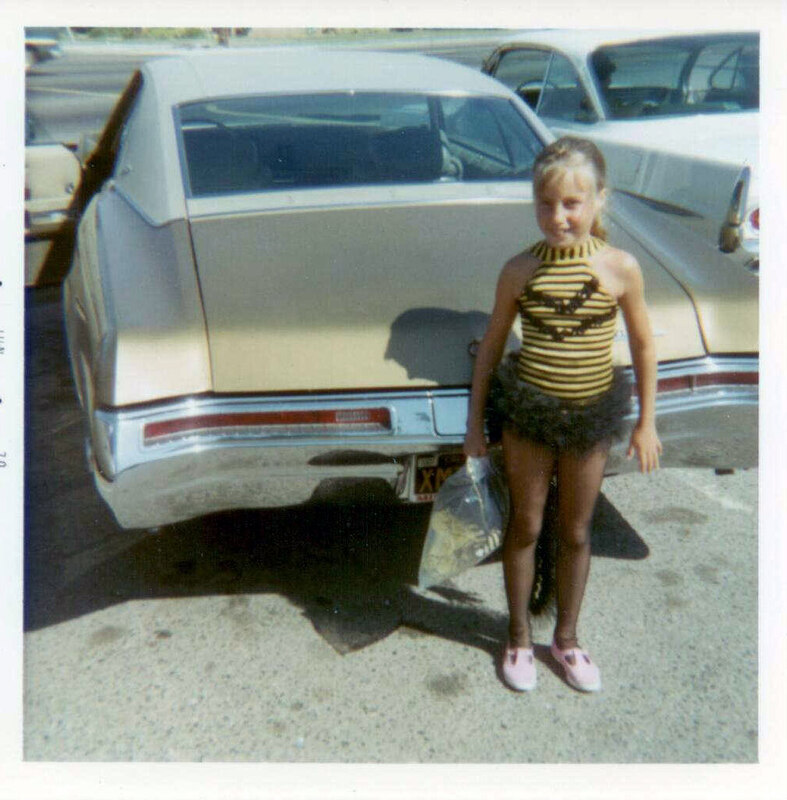 Yes, I’m dressed as a bumble bee — which probably enhanced my belief that I was fast. I think I’m holding the bumble bee antennae that we wore on my head. Yes, Jon Miller is THE best! It was a such a shame that the Orioles let him go. It broke my heart. But I know that San Francisco ended up being a much better fit for him. I’m so grateful for Sirius radio and MLB Extra Innings … so I get to hear him from time to time. Well, we are really fortunate to have great baseball announcers out here. On both sides of the Bay. But, I strongly prefer the Miller Fleming team over all of them. They are very good. Kuip can put me a little on edge at times, because he talks about a play in the present tense (as many sports announcers do) even though the play is complete. Kruk and Kuip are good. They tell some good stories and bring great attitude to the booth, but I’ll usually take any combination of Miller, Kruk and Fleming over a team that includes Kuip. BTW, Kuip shops at one of the grocery stores in the neighborhood. I’ve never seem him, but my son has bumped into him 2 or 3 times at the deli. Once, he heard someone ordering at the deli counter from around the corner and the voice was unmistakably Kuiper’s. Sure enough, there he was picking up his potato salad or such. Ah, the life lessons we learned from our fathers. Thanks for the memories. Thanks. Really enjoyed the weaving together of your lovely memoir and Baseball lore. 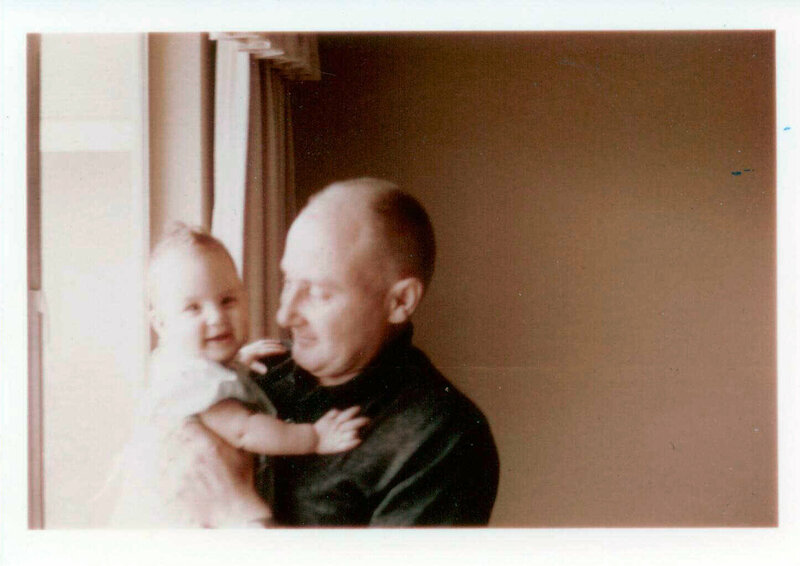 You might enjoy the Fathers Day post on The Immortal Jukebox. Regards Thom. Thanks Thom! I’ll definitely stop by and read your Father’s Day post! Wow, dad, that’s awfully sneaky — and pretty awesome. I would not have been clever enough to think up that one. He was always coming up with something. All those pranks must have given me my love for April Fools Day! Jon Miller once pondered why a foul pole is called foul since a ball hitting a pole is a fair ball. “Should be a fair pole” he said. Yes, I like that foul pole/fair pole thing, too. Not everything has to be black and white, right? It’s more fun when there’s a bit of mystery to the game. Sort of like figuring out when a balk’s a balk. That balk thing is like BABIP or NASA to me, but I love all three especially when a cardinal commits it, the balk that is.